Honeywell (NYSE: HON), a global leader in Connected Buildings, today introduced Honeywell Vector Space Sense in the Middle East, a software solution that shows where, when and how building spaces are used at any given point in time. As a result, the building operations team can make better-informed real estate and space usage decisions that provide opportunities to optimize costs and promote better building experiences for occupants. “Expenses associated with unused building spaces often go unnoticed, simply because it’s so difficult to get an accurate, moment-by-moment view into how building spaces are used, or if they’re being used at all. 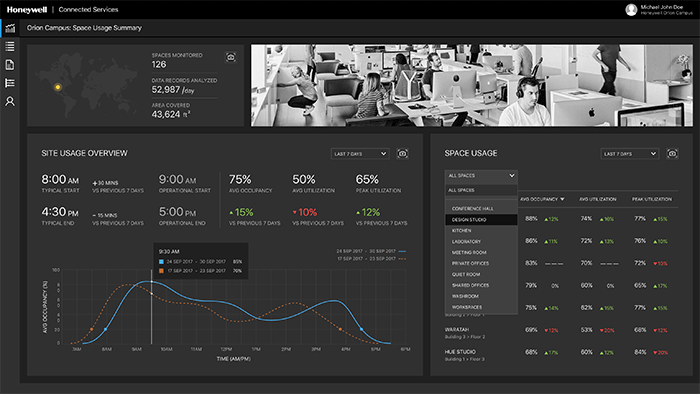 Honeywell Vector Space Sense takes the mystery out of space usage through real-time, IoT-enabled insights that give organizations the real picture of where and how people are using spaces, so they can get the most out of their buildings. Key real estate stakeholders are then able to make better informed decisions to further enhance a building’s infrastructure and improve the building occupant’s overall experience,” he added.